The Shashi Search covers the entire database and allows for searches of the basic information (such as bibliographies), tables of contents, indexes, chronologies, and appendices. Search the entire database by free keyword. A list of all the shashi contained in the SSD with links to further information on each volume and its contents. A list of shashi by industry. 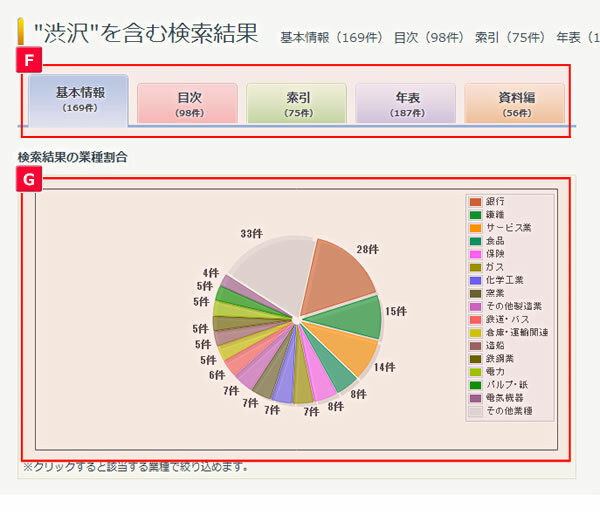 The pie chart on the top page shows the number of shashi in the database by industry. Hover the cursor over each slice of the pie to display the type of industry and click either the industry from the list or the corresponding pie slice to view a list of shashi in that industry with links to further information and the contents of each shashi. Search the database by company name. A list of personal names that have been automatically extracted from the index data contained in the database. Note: Since personal names were automatically extracted, the list is not necessarily exhaustive. In addition, data other than personal names may be included. Links to Wikipedia articles have been generated automatically based on personal names and may not be accurate. 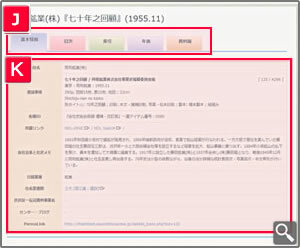 Keyword search results are displayed under the following tabs: Basic Information (基本情報), Tables of Contents (目次), Indexes (索引), Chronologies (年表), and Appendices (資料編). Each tab also includes the number of search results for that section. The default for a search results page is Basic Information. Clicking on a different tab from the tab menu will bring up results for that category. A pie chart showing the percentages of results by industry is displayed at the top of the search results for each tab. Hover the cursor over each slice of the pie to display the type of industry or click a slice to view the results for the shashi in that industry. The titles of individual shashi on the Shashi List or Shashi List by Industry pages include a link to the Basic Information for that volume. There are also links in the icons that appear in the Table of Contents, Index, Chronology, and Appendix columns of the table. Clicking the plus sign (+) adjacent to the Shashi List by Industry heading on the Search Menu to the right side of the Search Results screen displays a drop down menu with links for each industry. Likewise, clicking the plus sign (+) adjacent to the Personal Names List displays a drop down menu with links to alphabetical listings of names. The Shashi Details page for each volume is divided into the following tabs: Basic Information, Table of Contents, Index, Chronology, and Appendix. The default for a details page is Basic Information. Click on a tab to display the information from that category. Provides a brief introductory description of the shashi including bibliographic information and holdings information via WorldCat, NDL ONLINE, and other resources. 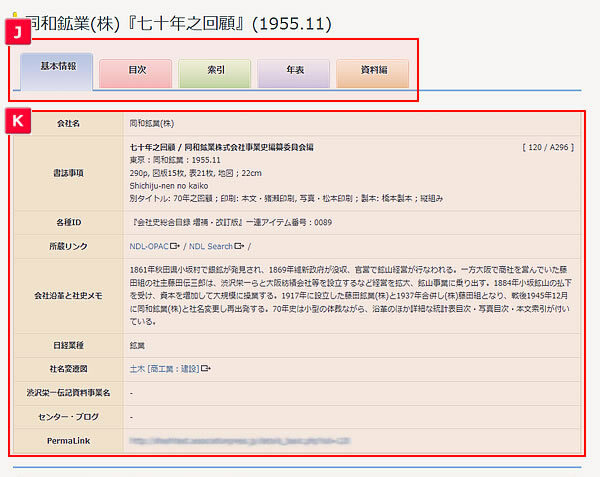 When available, links are also provided to corresponding pages in resources created by the Shibusawa Eiichi Memorial Foundation, such as the Name Change Charts of Companies and Organizations Related to Shibusawa Eiichi (渋沢栄一関連会社名・団体名変遷図). The full table of contents from the shashi. Clicking on a title listed under the “Table of Contents” tab on a search results page will link to a partial table of contents that only includes sections applicable to the search conducted. The drop down menu on the left side of the screen allows users to jump between this partial table of contents and a full version. If the volume of shashi being looked at includes an index, the table of contents page will include links in the page numbers that, when clicked, display index terms contained in the corresponding chapter to provide more information on the chapter contents. If the shashi includes an appendix, a book icon is displayed beside the table of contents page number. The icon contains a link to the Appendix tab, with information on the type and contents of the appendices with the corresponding section highlighted. 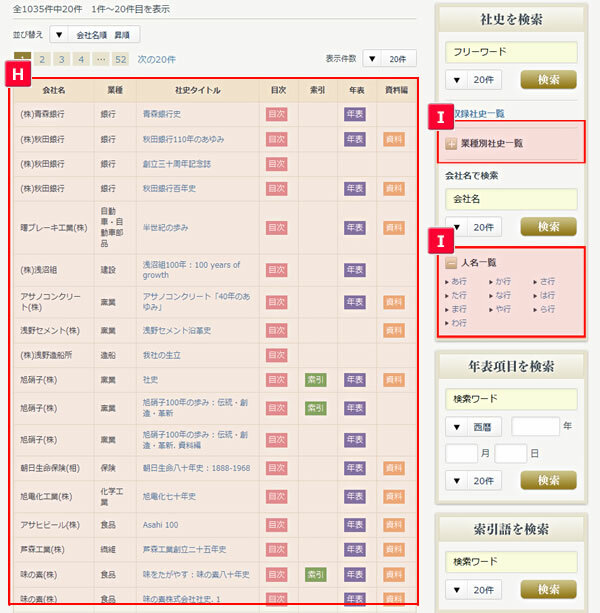 Lists all of the entries in the index by Japanese and alphabetical order. Clicking on a title listed under the “Index” tab on a search results page will link to a partial index that only includes sections applicable to the search conducted. 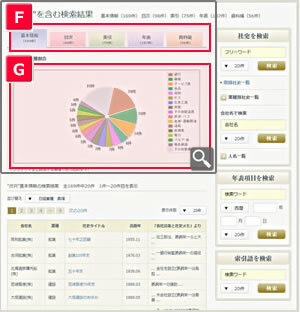 The drop down menu on the left side of the screen allows users to jump between this partial index and a full version. The index page displays terms by starting letter or phonetic Japanese character. Clicking the next letter/character or “next page” buttons at the top and bottom of the index will jump to the next heading. The list on the right side of the page provides links to all available letter/character headings. Clicking on an index term jumps to a partial table of contents page with the sections where the term appears highlighted. 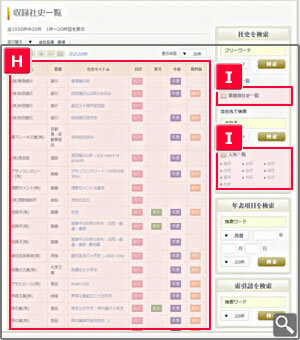 Below the Japanese and alphabetical listing on the right side of the page is a link to a list of personal names that appear in the selected shashi. 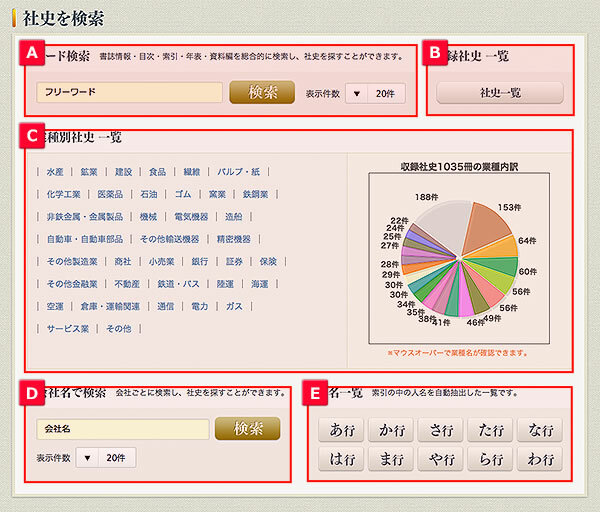 The personal names list is similar to the general index page with names listed by Japanese and alphabetical order. Links to Wikipedia articles have been automatically generated where available. Lists the chronology data from the shashi. Clicking on a title under the “Chronology” tab on a search results page jumps to a partial chronology that only includes items within the chosen shashi applicable to the search conducted. The drop down menu on the left side of the screen allows users to jump between this partial chronology and a full version. A full version of the chronology will highlight items that include the search term in purple and items from a separate chronology related to Shibusawa Eiichi in grey. Lists the contents of the appendices in the shashi. Clicking on a title under the “Appendix” tab on a search results page jumps to a partial appendix that only includes items within the chosen shashi applicable to the search conducted. The drop down menu on the left side of the screen allows users to jump between this partial appendix and a full version. Contents 1 contains mainly the titles of materials included in the appendix. Contents 2 contains mainly the dates of materials included in the appendix. Contents 3 contains mainly a detailed description of the contents of materials included in the appendix. Copyright © Shibusawa Eiichi Memorial Foundation. All Rights Reserved.